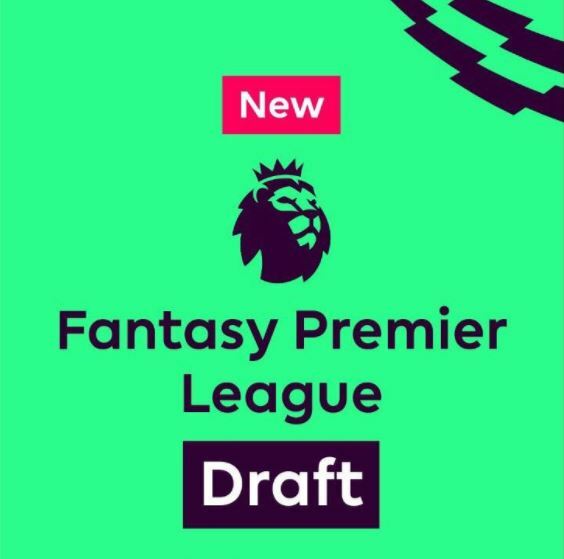 Dubbed as an, “exciting new format” Fantasy Premier League Draft will run simultaneously with the traditional game for this upcoming EPL season. Without fanfare or ma ny details, lots of questions beg to be answered about this new format. Having spent the past 37 years playing fantasy (NFL) football, I am somewhat torn in with this news. The 2017/18 EPL season will represent just my 5th year participating in fantasy football, as I learn, grow and experience the beautiful game as a fantasy manager. Details didn’t provide the full scope of the draft game, but I feel some assumptions can be made based on the announcement. Managers can expect to participate in a live snake style draft, in which managers unique players for their 15-man squad. League size appears to be flexible from 2 to 16 team mini-league. All this in a new game, while remaining with in the £100m budget. Let us not forget this will also introduce some form of free agency/waiver wire to the game in order to transfer players. The most difficult part of this style of game will be the draft. No more deciding who to partner with Kane and Lukaku, as they will be owned by different managers. Even the best prepared manager must be willing to compromise and plan out their draft strategy in order to be successful. The draft game will really be dependent on the size of the league you are involved in. In my fantasy NFL football experience, the more teams involved, the more difficult it becomes to field a strong starting team. With 32 NFL teams, there is an offensive player pool of approximately 640 players. In the fantasy draft game, with just 20 teams, the player pool shrinks to approximately 500 players. In the NFL game, it’s not uncommon to draft backup players at certain positions, something that isn’t often done in the traditional game. We do occasionally see it with goalkeepers, such as Ben Foster and Boaz Myhill. Based off last season’s statistics, only 6 players eclipsed the 200 point mark. Of that number, just two were forwards; Harry Kane and Romelu Lukaku. If you happen to be in a 10-team league, your potential top forward at the #10 spot would be Alvaro Negredo, Fernando Llorente or Troy Deeney. Doesn’t instill much confidence, does it? This is where you draft strategy comes into play and the decisions you make will shape your squad. With the #1 overall pick, do you draft Sanchez or Kane? If you draft Kane with this pick, you will get the top forward in the game and be able to partner him with another lower priced forward in a possible 3-5-2. Draft Sanchez and you start building a solid midfield, but won’t see a forward for another 19 picks, which means many of the top 10 midfielders will be gone. With a 10-team league, that’s 50 midfielders and 30 forwards selected. Quality players will be at a premium, You will be relying on your top draft picks to carry your squad over 38 weeks. It could be that a 4-4-2 becomes the formation of choice, based solely on the lack of quality forwards. There is considerably more depth at midfielder and defense. Regardless of strategy don’t expect the sort of weekly point totals you see in the traditional game. Even the best laid plans can go astray, as luck will always play a roll in our fantasy game. We will wait and see to make further evaluations on the FPL draft game as it rolls out the week of July 10th. By no means do I consider myself a fantasy football expert, experiencing just my 4th season playing in the FPL. Like any fantasy game played, it’s a learning experience, sometimes made simpler thanks to website and pundits, who provide their analysis and opinions. Not new to the EPL or football in general, as I have played and watched the beautiful game much my life. Yet living in the United States, soccer takes a backseat to many more popular sports; NFL, NBA, MLB, NHL and NASCAR. Last year was a real struggle after GW6, seeing only 5 green arrows out of the ensuing 20 gameweeks. I analyzed players, statistics, as well as my strategy in order to stop the free fall. It eventually happened in GW27, finishing the 2017/18 FPL season on the back of 10 out of 12 green arrows, recovering admirably to win one mini league, but finishing well of my initial goals. The new EPL season hasn’t begun and price information for the new game won’t be revealed until the week commencing July 10. Until that time, it’s speculation and strategizing for the upcoming season. 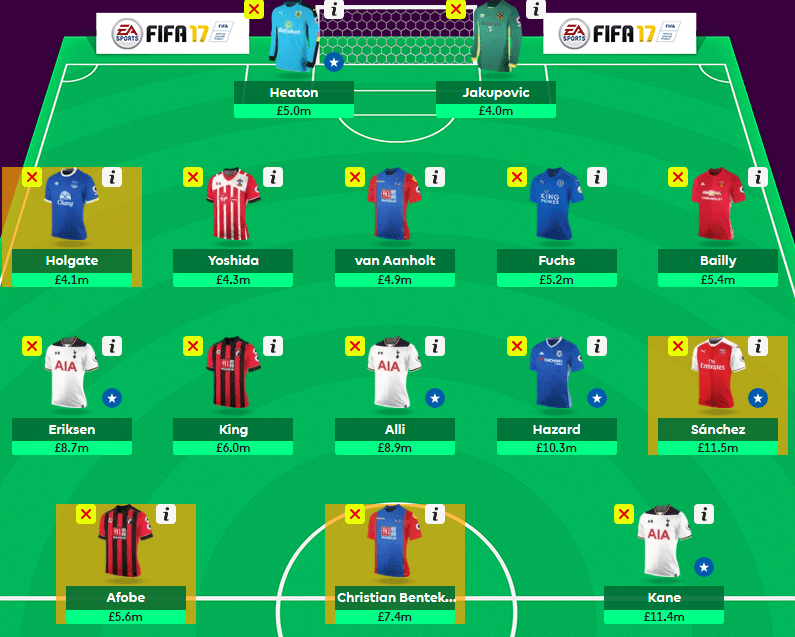 I have been doing that a great degree using a few different websites, following along in many threads to get input and advice from other, more experienced (hopefully) fantasy managers. I was turned on to the site Mathematically Safe authored by Peter Blake, which discussed a three-way budget defender rotation. The link I clicked was for the 2016/17 FPL season, but provided great insight for the upcoming season. Not knowing if Peter would provide a similar article for this season I begun working through the process of finding the best three defender rotation. My bottom 10 were nearly inline with the bookies, who included Bournemouth, as opposed to Leicester City. For my analysis using Peter Blake’s methodology, I included both squads for a total of 11 teams. While working through all the combinations, I saw that Peter updated his article for the upcoming season. Unlike last year, this year he used the bottom 8 teams, which still feature prominently in my analysis but with a few changes. He included West Ham, while omitting Leicester City, Bournemouth and Newcastle. 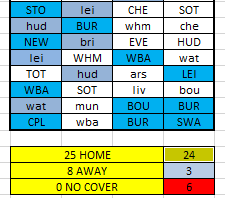 Using Peter’s method and all the 3 team variations I set out to find the best home/away fixtures featuring the bottom 11 teams. The results are contingent on each team having a “budget” defender priced at £4.5m or below that starts. You can download my worksheet for all possible combinations. After spending parts of 3 days working through schedules, I was disappointed to see that Peter had finished his budget defenders article, but would with anticipation to read and compare with what I done. Bournemouth was woeful in defense last season, but the recent addition of Asmir Begovic in goal and Howe focusing on improving defensively this off season could possibly yield a worthwhile defender including Steve Cook and Adam Smith. Swansea offers up Alfie Mawson (finished at £4.6m) and Martin Olsson (finished at £4.1m). Watford under new manager Marco Silva could tighten things up at home. Most of their defenders should be under £4.5m, the only possible exception being Jose Holebas. Burnley played outstanding at home, witnessed by Tom Heaton’s numbers. In front of him Brent Mee (finished at £4.4m) and Matthew Lowton (finished at £4.5m) could be contenders. Chances are Michael Keane will be priced at £5.0m. Bruno Martins Indi (finished at £4.9m) and Erik Pieters (finished at £4.6) could be the budget route into Stoke City. Pieters 6.7% TSB was the 9th overall budget defender under £4.9m. West Brom shows prominently in many of my combinations, but would leave managers with Johnny Evans (finished at £4.4m) and Allan Nyom (finished at £4.4m) as the only budget buys in the Baggies back line. Once prices are released, the week of July 10th, the rotation picture should be clear. While nothing will be set in stone, this article, as well as Peter’s latest, 3-Way Budget Defender Rotation should give many manager a solid starting point. If I had read his article before I delved into the data, I would not have run all the team combinations, but looking back on it, I am glad I did. Good luck in the upcoming FPL season! Now that we have had a week to digest Chelsea winning the EPL, Arsenal winning the FA Cup, Harry Kane winning the Golden Boot and the fact that Marco Silva was recently hired to guide Watford, it’s time to reflect deeper into the season. By no means did my squad, the Go ‘Orns have a successful season. However, I end the season with green arrows in 10 of the last 12 weeks, which featured a run of 8 green arrows in a row. To think I had this game figured out after GW6 when I was ranked 29k but the next 20 weeks did me in, finishing 446k in the overall rankings. To dissect this season, I have decided to compare my finish to that of the top 5 winners in the 2016/17 FPL season in order to find the commonalities they shared when it comes to being a successful manager. It doesn’t take a mathematician to crunch the numbers and draw conclusions on my poor season. The spreadsheet is broken down into 5 categories, based on the information provided from FPL Statistico: actual points, captaincy, transfers, formations and squad stats, common players. Actual Points: One goal at the start of a season wass to average 60 points per game week (PPGW). Last year I averaged 57.1 PPGW, just 2.89 off that average. When reviewing the season that was, it came down to making stronger captain selections and decreasing overall transfers. Averaging 60 PPGW will get you in the top 25k of most season. From that point it’s about the captains, transfers and differentials to make the difference. This season I averaged a paltry, 53.6 PPGW, down 3.5 points from last year. The struggle was real! But it doesn’t tell the entire story. The top 5 players in the world averaged 66.7 PPGW. Yet these numbers need to be broken down to yield failures and in their positions, the success they achieved. Captaincy: Handing the captain’s armband to the incorrect player or taking a punt can be detrimental to your overall rank. On the season I earned 531 points by captains, a 13.97 average. 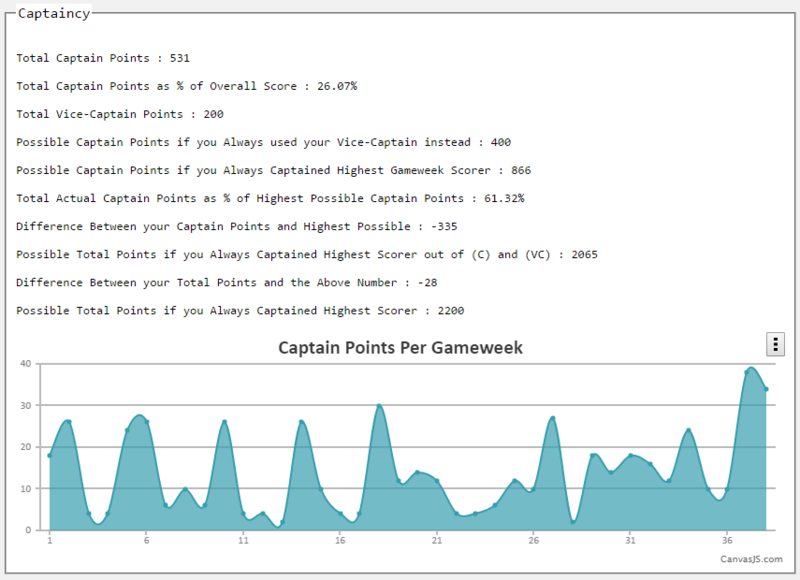 Of the top 5 mangers, only one failed to achieve 700+ points (664) with their captain selections. Two managers recorded 755 points scored (29.45% of total score), while two others scored 713 points (27.86% of total score). The underlying numbers show that Aguero, Lukaku and Sanchez were the favored captains with Ibrahimovic and Costa receiving an honorable mention. Looking at my squad, there were 4 weeks in which my captains totaled 14 points, with Coutinho being the biggest bust, 2 weeks captained and 4 total points. The one success I had was Bailly, captained for DGW34 with 24 points. Transfers: I’ve already written an article on transfers, Premier League: Excessive Hits, in which I detail how all 72 transfers played out each week. The numbers were quite revealing, showing that while I might have been 20-30 points over the weekly average, my gain was far less that what I expected because of a -4, -8 or -12 point hit to my overall score with regards to players I transferred out. The top 5 managers averaged 3.89 point hit/week, with one manager only take a total point hit of 20 on the season! Impressive! Even more so the one manager who took just 39 hits over the season. With 152 hit points, I set myself up for failure, especially when you look at the raw numbers and see a total point gain of only 336 points. Two of the top five managers exceeded 400 points (407 & 429 points) on nearly half the total transfers that I took. Combined the top 5 managers totaled 144 hit points! Formations: Is 3-4-3 better than a 3-5-2 when it comes to how you set your formation? Three of the top five managers heavily favored the 3-4-3 formation, while two others were split between 3-5-2 and 4-4-2, a tried an true classic at least on the pitch. The 3-4-3 formation was my favored. I did attempt to use the 3-5-2 six times after activating my WC in GW21. All managers averaged, regardless of formation averaged 63.42 points per week with a 4-4-2 formation yielding the highest average of 67.5 (12 times). There was a big discrepancy when it came to the Bench Boost (5-5-3), I scored just 139 points while the top 5 mangers average 183.6. The high score being 193 and the low 171. Squad Stats: There really is no comparison in this category. While I had good players at times, overall position scores came in very low when comes to the top 5. I outscore just a single manager at the position of goalkeeper recording 159 points to his 138 points. Two managers exceeded 200 points (210 & 212) averaging over 5.5 PPG from this position. Defensively I struggled all season averaging 3.78 PPG (457 pts). All but one manager finished over a 4.0 average, while a single manager posted 625 points, 83 points clear of the next manager. This was a great year for midfielders with the top 5 recording nothing lower than 838 points and topping out at 909 points. Compare that to my squad with just 720 points. This with the majority of managers starting with a 3-4-3 formation. At forward I did beat one manager, scoring 583 points (5.89 avg) to his 546, still his PPG was higher 6.07 PPG versus 5.89. A score of 699 was the highest for all forwards (6.05 PPG). Common Players: Looking through the top 5 teams I have compiled a list of 11 players based on game weeks played. No surprise that Sanchez tops the list with 126 appearances (25.2 avg) and 1672 points (13.26 avg), while Lukaku is a distance second with 103 appearances (20.6 avg) and 1061 points (10.20 avg). Kane only had 44 appearances in these teams recording 669 points (15,20 avg). Sanchez and Lukaku were the only two players to feature in over 100 game weeks played by the top 5 managers. Aside from Sanchez’s dominance in the midfield, it was Hazard (73) and Eriksen (70) as the other top midfielders by appearance. Eriksen scored 503 points (7.18 avg) to that of Hazard’s 428 points (5.86) and Alli’s 416 points (7.42 avg). McAuley, one of three defenders to make this list had 93 appearances, Alonso, 78 appearances and Walker with 67 appearances. However Alonso finished with 420 points (5.86 avg) besting all other defenders. Sanchez was the most captained player (10.8 avg) who scored the most bonus points (25.4 avg). However there is a large discrepancy when it comes to Sanchez on my squad, who was my top footballer with 132 points. I captained him 8 times but only received 6 bonus points, well off that bonus point average. Just going down the list of these players most I had were 1-2 points off the top 5 manager average. Also looking at the game weeks players none of my players exceed 19 weeks played, which was Costa, Eriksen was at 17 weeks players. Many of the top 5 managers had players exceeding 20 weeks played with one manager having two players who each played 31 game weeks for him. This tells me I need to either make better selections to start the season or be more patient with the premium players. You can see the data on the spreadsheet. 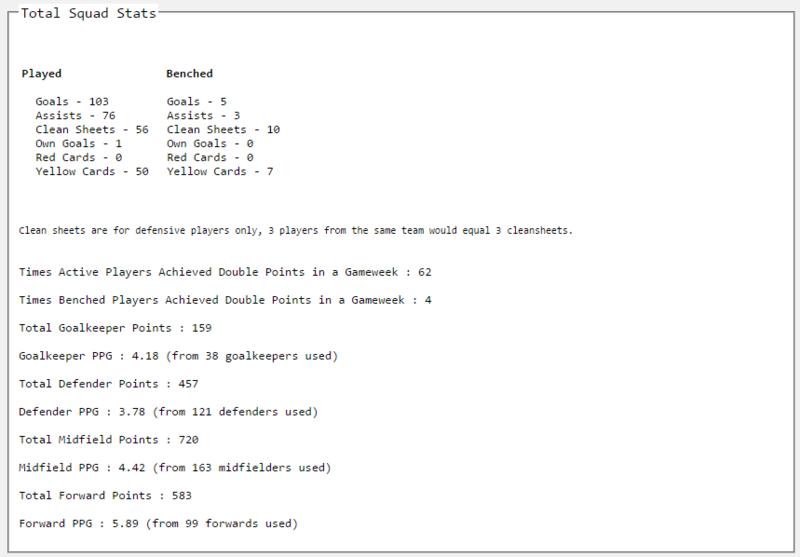 All the categories are taken from FPL Statistico. This all confirms what some pundits have been saying all year. Defensive players and captain’s armband can play a big role in the success of a season. Mistakes, such as excessive hits or gambling on a punt or two could prove futile. League play is finished, as I was not able to catch a second of any GW38 action due to problems at work that required my full attention. In hindsight, that might have been a blessing, as it seems my squad always scored better when I wasn’t watching. First let me say it’s been an enjoyable year, even if my squad didn’t meet the expectations I set forth at the beginning of the season. Being just my 4th season of play, I have learned some more valuable lessons, picked up some new tips and strategies I can apply to next season. However I did notice my reliance more on fantasy sites this year than in the previous years. That comes as a mixed bag, occasionally having me think through a certain transfer, changing captains or shifting my strategy. Without actual evidence to support my total score, I would save more often than not, accessing fantasy sites work to my advantage. For GW38 it one of the best weeks I have put together all season behind #10, Harry Kane. Another 3 goals this weekend against Hull, making 7 in the last 2 weeks. He also donned the captain’s armband finishing the week on 34 points! I nearly changed the captain pick to Jesus while driving into work, but shut down the fantasy app so I wouldn’t second guess my starters. Speaking of Jesus, he finished with 11 points, a goal and assist with 2 BPS. While I had thoughts of moving Costa, I stuck with him, finishing with just 4 points. The midfield saw two changes, of which neither benefited me for GW38. 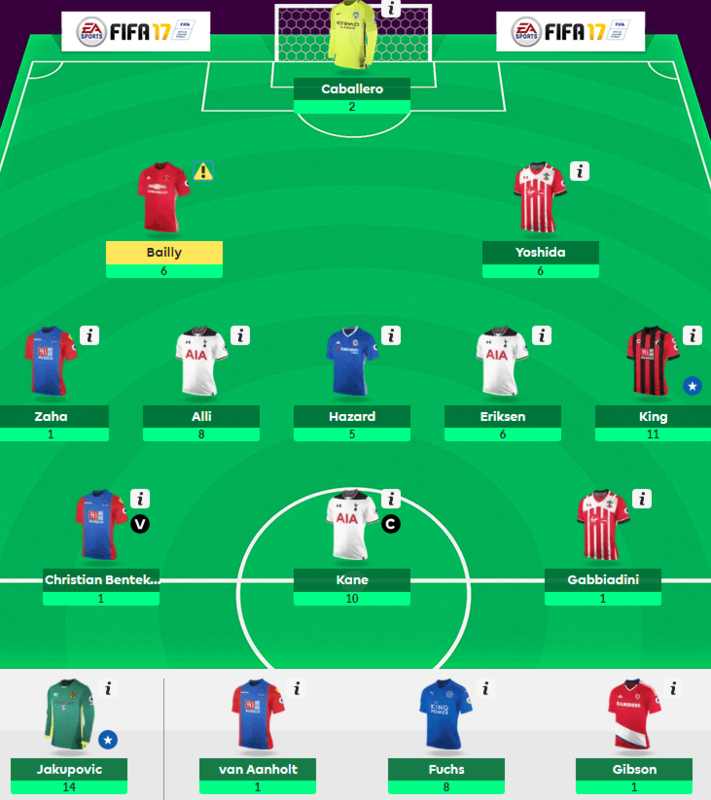 I had transferred Alli and Hazard (17 points) out for Fabergas and Sanchez (15 points), for a net -2 points on a -4 point hit. We saw King not play due to illness, which left just Eriksen as my only remaining midfielder from previous weeks, finishing on 2 assists, 1 BPS for 9 points. Defensively, it was mixed. Man City FINALLY came through as Calballero and Otamendi each picked up 6 points with a CS. I stuck with Yoshida and Stephen of So’ton against Stoke, but they combined for just 3 points in a 1-0 loss. That cost me some points as I expected So’ton to float past Stoke with a CS. If I wasn’t so dead set on grabbing Sanchez, more so because of his 3 doubles in the last 4 weeks, I probably could have saved a transfer, stuck with 4 starting midfielders and picked up Vardy or Batshuayi. Aguero was never in my plans. Still, I am pleased with the overall performance and score for GW38. As for the season, it could have been stronger but I finished the year strong, which gives me hope for next season. The Go’Orns entered their 4th year playing in Fantasy Premier League, on the success of the 2015/16 season, which I score 2170 total points and finished in the top 75k, I had high hopes to improve on both total points and overall ranking. 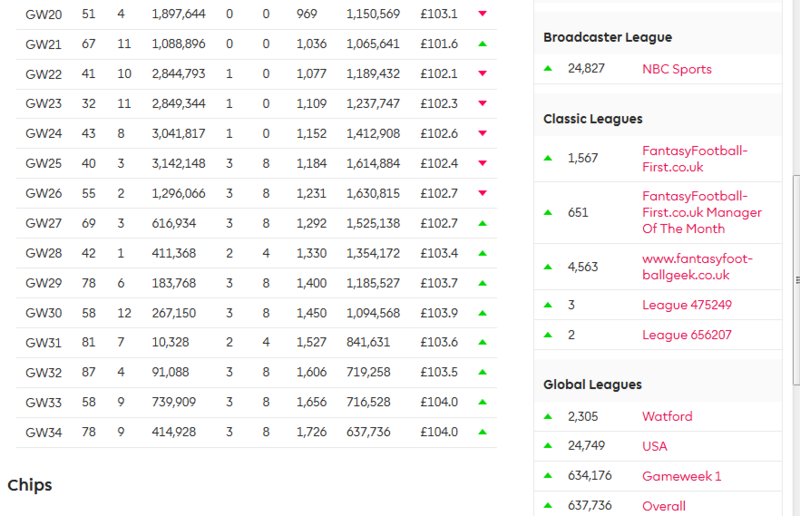 The season started great with 4 green arrows in the first 5 weeks and a overall rank of 29,038 at the end of GW6. The season had hit a high note very early and I thought I had mastered this season and would continue riding the wave of success. Little did I know the season was just starting and I was about to take some serious lumps. Over the next 20 weeks I would see just 5 green arrows, dropping from 29k down to 1.6m! The subsequent weeks saw just 83 points between GW7 through GW9, from that point on the season was over. Of the 5 green arrows, each was followed by a red arrow as I continued to slip further and further down the overall ranking. GW15 through GW17 was another slide, 3 red arrows with a s game slide in GW19 and GW20. 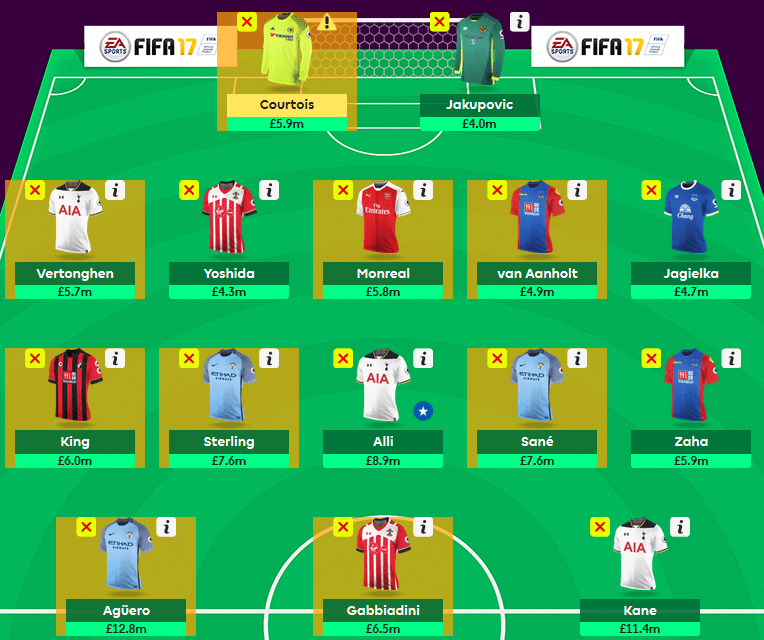 While I never really contemplated holding my second WC until the DGWs were announced, I needed a change and I activated the WC fo GW21. Like that during GW4, the WC brought me success and a green arrow and 67 points. It appeared the turn around was beginning, yet it was short lived. Rock bottom was hit between GW22 and GW26, my worst run of the season. Scores of 41, 32, 43, 40 and 55 didn’t help the bottom line and I dropped 500k sat at 1.6m. Starting GW25 I changed my strategy, while it wasn’t the best idea, I started averaging -8 hit per week through GW38. While GW25 and GW26 weren’t positive returns, GW27 saw the first of 8 green arrows and 10 out of the last 12 weeks. I missed out on GW35 (week avg 46 pts) and GW36 (week avg 46 pts) taking hits of -8 and -12 points. This was the sort of run I needed earlier in the season, if I wanted to salvage the season, but it never did materialize. I guess it was better late, than never. 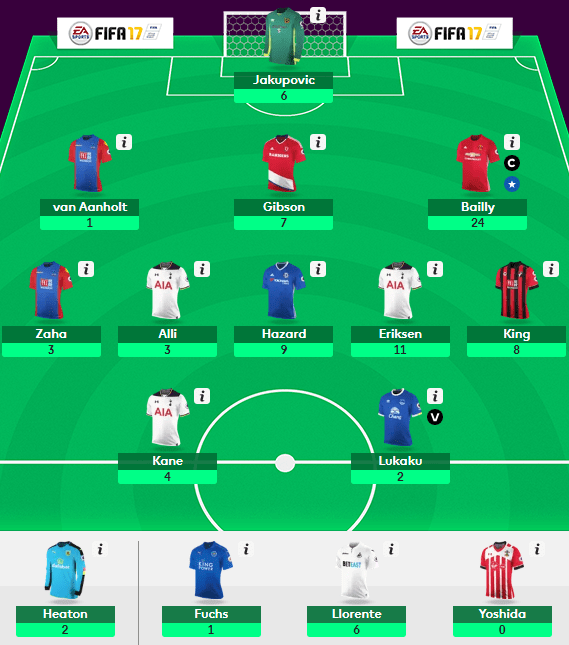 I took some chances during this period and benefited from the excessive hits I was taking in, with just 1 week (GW28) receiving a -1 net result as the players I transferred in scored just 3 points (vs a -4 point hit). It was the triple threat of Spurs that spawned my revival, starting in GW21 when I introduced a new dynamic to my squad. During this wild card period I transferred Rose, Eriksen and Alli in. Unfortunately Rose lasted just 2 games before he succumbed to a season ending injury. It wouldnt’ be until GW33 that I would finally pick up Kane (for the second time) with returns every week but GW36, Lest we not forget his 7 goals in the final 2 weeks of the season to win the Golden Boot. For me, I won one of two mini leagues, as Kane was a differential. Eriksen played every game from GW21 averaging 6.1 points a game and picked up 15 bonus points. Alli’s first go around was short lived from GW21 through GW24 returning 18 points, bringing in Sigurdsson for him. He returned in GW29 scoring 59 points for me through GW37. While I planned on keeping him, I dropped him in favor of Sanchez for the final week of the season. Together Spurs players scored 296 points in 43 appearances. This group topped my squad for points scored. Three players who were featured in 14 game weeks over the course of the season finished in the top spots for points scored on an individual basis. Not surprisingly it was Sanchez leading all scorers with 123 points (8.8/gm when played). Ibrahimovic and Lukaku rounded out the top 3 spots with 117 (8.4/gm when played) and 115 (8.2gm when played) points respectively. If it weren’t for his ineffectiveness and injury, my “man crush” probably would have score more points, but I could not keep a 12.0m player when he wasn’t scoring. Aguero scored 103 points in just 8 games, a whopping 12.9 pts/gm when played! By GW10 my love affair with him was over and I had moved on to players like Lukaku, Kane, Ibrahimovic and Vardy to fill the void. Defensively the Go ‘Orns were a mess. I used 29 different defenders and 6 different goalkeepers, with Eldin Jakupovic featuring on my squad for 37 weeks, starting just 6 times. Foster was featured 14 times, but I stuck with him too long at the start of the season when WBA hit some bumps and CS were difficult to come by. He averaged just 3.4 PPG in his starts. Heaton was the most effective, but I was late to the bandwagon, playing in just 9 games, but had 5 CS, 8 bonus points and a 5.2 PPG. Initially I had planned on Valencia being my featured defender for the season, but by GW15 I had moved him because of just 35 points in 14 game weeks (12 as a starter), just 3 CS and no offensive returns. Yoshida, the So’ton budget buy defender featured in 10 games return 52 points (5.2/gm when played), was a nice diamond in the rough during the later part of the season. Coleman appeared to have replaced Baines as the main offensive threat for Everton, brought in for GW23 he lasted just 7 weeks scoring 41 points, an average of 5.9 points! Unfortunately injury cut his season short and left managers looking for a replacement. Above all other positions, I struggled with consistency all season long. I missed Alonso because of the news of Ake coming back to Chelsea, which had me pick up Azpilicueta instead. We know how well Alonso performed starting at that point. For next year I will need to plan a better strategy than what I have done the first 4 years in FPL. No longer will can I rely on taking mutliple hits each week in order to improve my team. After my last write up, Excessive Hits, I realize that while I had a run of good weeks in which a -4, -8 or even a -12 benefited my sqaud with double digit returns, those were few and far between (WC asides). This means to start out of the box with a solid starting XI that performs when the whistle blows. We are usually left searching for or jumping on a hot player after just a single week. I know I did almost all year. Can’t truly say there is one right way to play this game. This year I started forward heavy with Ibrahimovic and Aguero, passing on the high priced midfielders like Sanchez and Hazard to start the season. It turned into a love hate relationship with Sanchez, always a step behind his good weeks and poor returns with the captain’s armband. I did favor the 3-4-3 formation 22 times this season, using the 3-5-2 just 8 times. I recall writing an article citing this formation after activating my second WC, but it didn’t last. However, the 4-4-2 used 5 times over the season yielded a 56.2 PPG average, higher than the 3-4-3 at 54.9 or the 3-5-2 at 54.8. Captain selection is an interesting statistic as Sanchez was the tagged 8 times for 100 points (12.5 pts). Kane and Aguero were each captained 5 times, averaging 15.6 points and 20.8 points respectively. Aguero was the only captain with 5 or more games that gained an average over 20 points. Some were very timely captains, such as Vardy in GW30/GW31, Bailly in GW34, Jesus in GW37 and Kane in GW38. For as many good selection, there were times that a punt didn’t pay off, Defoe in GW4 for 4 points, Walcott for 6 points, GW9 and Coutinho in GW13 for 4 points. Overall one thing remained constant, the fun and enjoyment of participating. If that is lost, then there is no reason to continue playing. While my initial goal had to be reevaluated (score more than 2170 points), I did meet the mid-season change of scoring at least 2000 points thanks to the final 2 weeks of the EPL season. On paper scoring 66 points a week seems so simple, each player would average just 6 points a game! Even 60 points a week is just a 5.45 PPG average. 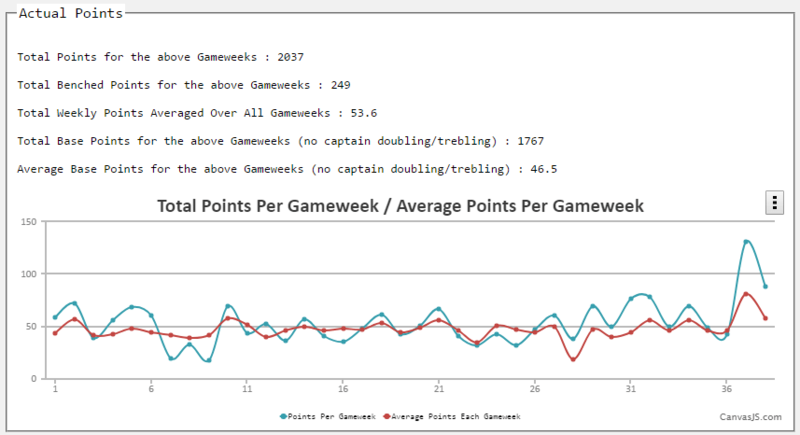 Over the course of 38 weeks not taking into account captaincy selections of players scoring more points, averaging 66 points a week gives you a final score of 2508! That puts you in contention to end up in the top echelon of the best in the world. Thanks to everyone for a wonderful season and see you next season! Over the course of the EPL season I have been attempting to justify my poor performance; EuroCup 2017 fatigue, inconsistency with big name players and lackluster defenses, not selecting the right players, but through it all one constant has remained. Hits. Hits. And more hits. For the season I have 72 total transfers, an addition 37 transfers over the course of the season for 148 points! When I look at my Overall Points (1949 thru GW37) and my Overall Rank (517,067) it comes as no surprise why I have struggled. 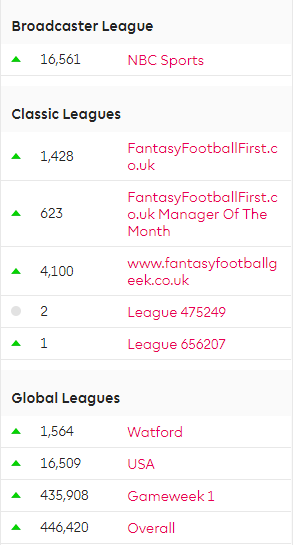 It wasn’t until I started to break down the numbers using FPL Statistico that I realized why I didn’t climb in the global rankings as I thought I would. The numbers appear staggering when you realized what that -4 or -8 point hit truly costs when you look at the numbers on a week by week basis. Let’s take a look at GW6. I transferred De Bruyne, Snodgrass and Aguero in for Hazard, Cazorla and Ibrahimovic out. I started De Bruyne and Aguero, who I captained, while Snodgrass was the budget midfielder. Together they finished the week with 38 points. Of those I transferred out, they combined for 7 points for a difference of 31 points. Since Snodgrass didn’t start, I gained only 36 with my two starters but also took an -8 point hit and netted 28 points. That was an example of a worthwhile -8 point hit. Unfortunately we must take the bad with the good and over the course of the year I had 11 weeks in which that extra transfer(s) didn’t pay off, resulting in a negative result or no gain. The worst example was GW35. I took an -8 point hit to bring in Benteke, Gabbiadini and Caballero for Llorente, Lukaku and Heaton. Aside from a bad week for the incoming transfers, those I transferred out scored 7 points more. Once we add in the -8 point hit, I finished the week with a -15 points. It would have been more advantageous to hold those three players for another week. Yet, that is a chance you take when you look at taking a hit. On paper, Man City looked like a good bet for goals and a clean sheet, but Middlesbrough played them to a 2-2 draw. Gabbiadini against Hull City was substituted off at 58 minutes, while Benteke finished with a yellow card and was substituted at 70 minutes against Burnley. This after 3 goals in the last 2 weeks. 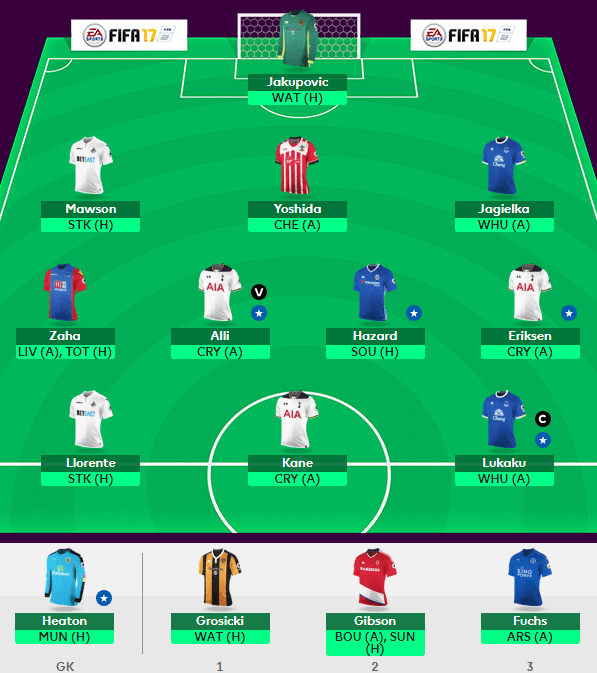 Starting with GW25 I took 100 points in hits, averaging -8.3 points a week. Not ideal by any means and it has cost me in the overall rankings, but I’ve had fun. 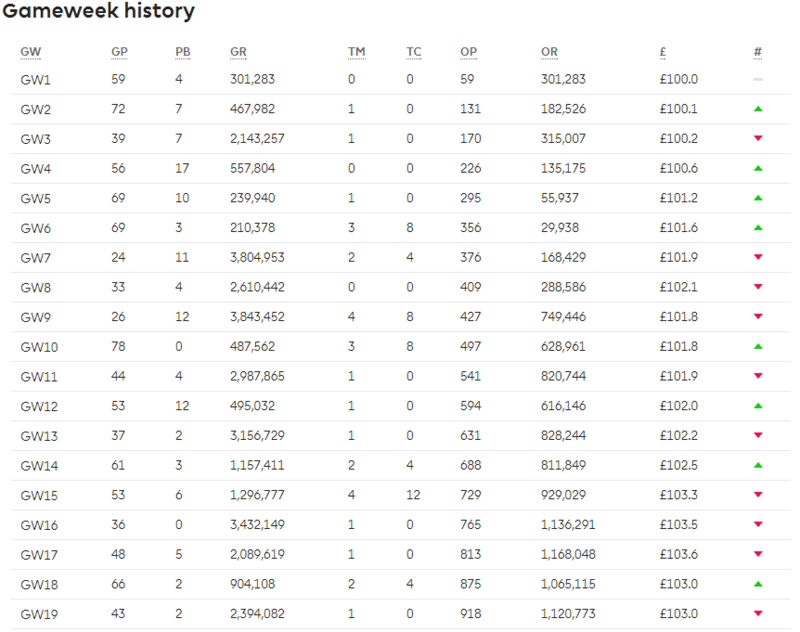 From GW27 through GW34 I recorded 8 weeks of green arrows and improved my overall rank by 977k. Here’s how that 8 week run played out when the points were broken down. During this 8 week snapshot there was just one week in which I finished with a negative return, GW28, which was -1 point. Overall I added 78 points to my overall total, by far the best run I had of the entire season. Interesting to note that the only other green arrow run I had on the season was from GW4 through GW6, which looks oddly similar to that of this late season push. The difference in the point hits, I activated my first Wild Card for GW5 but still took an -8 point hit the following week. 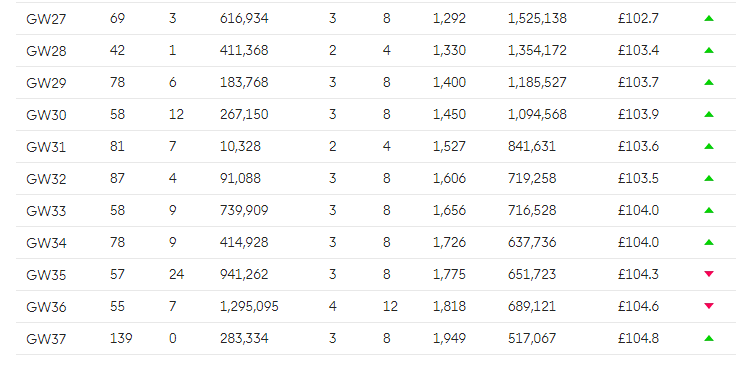 Not the best use of the Wild Card, but at the conclusion of GW6 I was ranked in the top 29k! 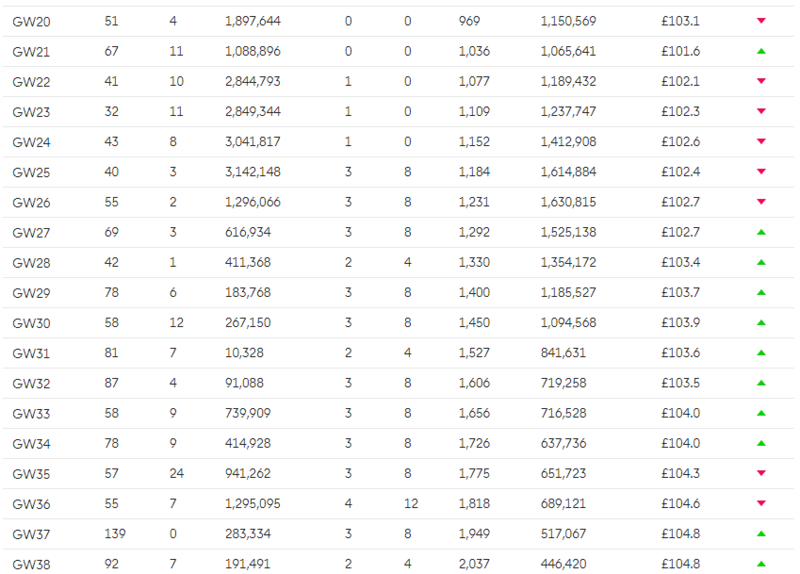 Overall, I gained 180 total points on transfers which cost me points. Divide that up over 37 weeks and it averages out to 4.73 points per week. Not a great average by an measure. As cited above, sometimes the extra hit(s) paid off, but in 12 weeks it was a net zero or minus points. Just 8 weeks provided a double digit advantage when taking hits (including both WCs). Any net result that was less than 9 points would have me rethink making that extra transfer for a week. You can view all 38 weeks of the spreadsheet here. By far the extra hits contributed to not exceeding my score from 2015/16 of 2170 points, finishing the season with 2024, well off where I wanted to be. Before I get started on DGW37, let me just touch on GW36, which saw me out of town and not available to provide my retrospect. I made 4 transfers to set myself up for GW36 and DGW37 to start the week with a -12 points. Ended the week with 55 points, recording my second red arrow in as many weeks, dropping 30k to 689k in the global rankings. While the defense played well, 25 points the midfield combined for just 12 points, which hurt. Thankfully up front Jesus was captained and Costa netted combining with just 2 from Kane for 18 points. As for DGW37, lots of planning and in the end good execution aside from the -8 point hit. I’ll talk about all this hits I took this season in my next article. 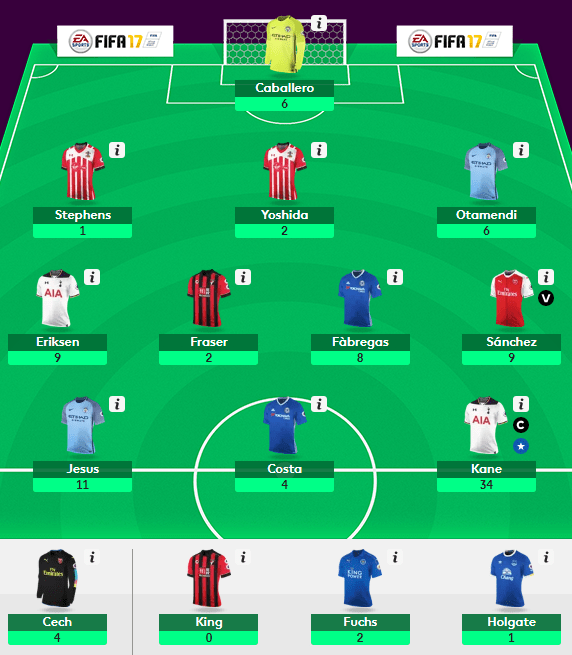 Finished the game week on 139 points, my best total this season and over the last 4 years. Very pleased with the score and performance of my squad, minus Fuchs. The average for the week was just 81 points, while the high score was 223 points! Impressive, but a triple captain from Sanchez truly paid off for that score. Only Kane would have been a better TC candidate. More on him shortly. My 139 points saw me finally break duck and push me to 517k in the global rankings. Last time I was ranked this high was after GW8. It’s been that bad of a year. Again, all the hits have truly caused my overall ranking to suffer but did see 8 green arrows in a row. More importantly, I now sit in 2nd place in both my mini leagues, one which I am already writing off as I am 244 points off the pace, but the other I am just 14 points back with Kane and Jesus being HUGE differentials for me the past few weeks. The Caballero move failed in retrospect, which was disappointing. City had Kompany back defensively and LEI and WBA at home. Unfortunately, City conceded once in each game. The addition of Otamendi was a point worse than the Caballero, as the duo recorded just 9 points in their two games. Yoshida made up for the 2-1 win against MID with a CS against Man United giving him 9 points over two games. With the Bench Boost played, Stephens picked up 8 points and Holgate just a single point, after being pulled at half time. One of those hits I took in GW36 was introducing Cech for 4 games, recording 9 points in DGW37, gaining a save point and a CS. The midfield was rather depressing, big names, little scores. My single game player, King was the top scorer with just 9 points. Eriksen recorded 8 points against Man United with an assist and 3 BPS, but sat out against Leicester yesterday. Frustrating, especially seeing how well Son played. Alli thankfully picked up an assist in the 6-1 thrashing of Leicester, but with that many goals I expected more. Finally Hazard. Chelsea score 5 goals over 2 games and he returned nothing but a single CS point. I had wavered on Hazard and/or Sanchez for DGW37, but couldn’t make both happen and didn’t want to interrupt my trio of Spurs players. My bench player, Fraser of BOU added 4 points. Up front Jesus (captain) and Kane combined for 69 points during the DGW! Jesus scored 1 goal and 2 assists with 4 bonus points, while Kane scored 5 goals, 1 assist and 4 bonus points. These performances alone powered me to my 139 point total. Costa, much like Hazard didn’t return against WBA and sat out against WAT. Aside from the -8 point hit, I was all smiles with this performance. Again, looking back at my DGW 36/37 plans I had hoped to add Sanchez, but my budget wouldn’t allow it without taking a hit up front and I didn’t want to sacrifice any of my staring forwards. Little did I know Hazard and Costa wouldn’t return and in fact sit out one game (Costa). As mentioned the combination of Caballero/Otemendi failed me, but Heaton/Bailly wasn’t much better with just 8 points. Bailly played in just a single game, but did record a CS. Caballero was a bigger failure as I sacrificed Jakupovic in GW35 and he returned 14 points. Expectations were higher for Holgate and Fuchs. Holgate pulled after 45 minutes in his single game missed out on the CS. Fuchs disappointed with zero points against City and a -1 against Spurs. He was a budget buy who had a DGW, while carrying an offensive threat, which is my justification. It appears I will hit my updated goal of 2000 points, after realizing I wouldn’t be improving on my 2015/16 total score of 2170 when I finished in the top 75k. Now if GW38 were straight forward I would feel a bit more confident about my chances, even though I need just 51 points, a score I have exceeded in the last 9 weeks! Looking ahead, I am planning on just a single move and don’t want to take any hit for the final week of the season. Questions remain as to the status of some starters; Costa, Hazard, Kane, Alli, Eriksen all come to mind. Amazing the amount of variables to take into account, when just a few short weeks ago when I posted Premier League: Seeing Double and my plans for the run in to DGW36 and DGW37. With change in the wind, injuries on the pitch and questions surrounding form, formation and fixtures I have taken a risky route over the next few weeks. Just 5 players remain from the plan I formulated prior to GW33. With already have played my WC in GW21, it would be a string of hits in order to get the proper personnel in place to take advantage of the DGWs. Original thought was to triple up on Man City, but the injury to Aguero and the rotation risk of Sane tempered my transfers. However the return of Jesus has sparked interest in City for DGW37. Before moving ahead, let’s take a look at DGW36 and who isn’t in my starting XI or even on my squad. The two most notable names, Gabbiadini and Sanchez. Based on recent form, neither deserve a starting spot. Since returning from injury Gabbiadini hasn’t been the same offensive threat we saw when he made his move from Serie A. Even when at Napoli he wasn’t a prolific scorer; 5 goals in 23 games last year and just 3 goals in 13 this season before the transfer. So’ton’s DGW schedule isn’t kind, facing Liverpool (A) and Arsenal (H) in GW36 followed by Middlesbrough (A) and Man United (H) in GW37. I fancy that the Boro match up is their only favorable fixture, a team they defeated just 1-0 back in GW15. Rumors of discontent are running through the team, as well as the impending return of Austin from injury and the veteran, Long off the bench to steal minutes. The exclusion of Sanchez doesn’t come without risk, the league’s top scorer (214) has been omitted, in fact I didn’t have him included when I wrote up my original plan during GW33. Earlier this season, I felt Sanchez was indispensable (read Sanchez Effect) and before running the stats, felt NOT including Sanchez was a reason for my lack of performance. The reality of the situation, he would have contributed approximately 59 points over the gameweeks I didn’t have him versus the players I did start in his place. The last 6 weeks have been his worst run of the season, with just a single return in GW33 (7 pts). How does he warrant a place in the starting XI? Wenger is now experimenting with formation, Sanchez is still playing wide left, but is he just playing out of the season before moving on? Based on the reverse fixtures against Man United and So’ton, he totaled just 2 points! Looking ahead to GW37 he posted returns of 5 and 13 against Stoke City and Sunderland. If fantasy managers see that sort of return in GW37 using the triple captain chip, they should be elated. However I feel there are stronger, in form players to start in the midfield. The one component you can’t take away from Sanchez is his explosiveness. For GW36 I have taken a 12 point hit. That hurts, it’s bad enough I have been on a nasty string of -8 points hit (6 out of last 7 weeks), which feels as if it has become the norm. Unfortunately, these hits come at a cost of limiting my climb up the global rankings. However the returns have been positive with just a single red arrow since GW27, last week in GW35. Still sitting at 651k, is considerable lower than I anticipated to be at this point in the year. Still, take the good with the bad and look forward to the next fixture. I finger a poor run of form starting GW8 through GW13 as a reason for my current ranking. 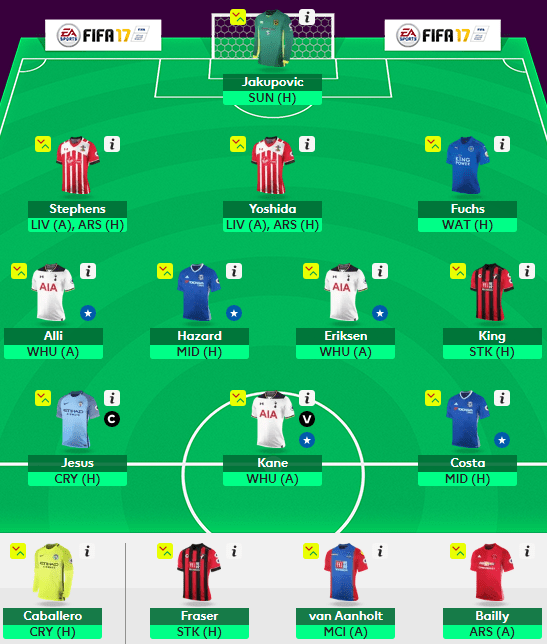 As for the GW36 squad the changes have come up front, as I moved out Benteke and Gabbiadini this week in favor of Costa and Jesus. To free up enough budget, I said good bye to Zaha and brought in Fraser from Bournemouth. The other addition this week was introducing Stephens for Gibson and getting his price bump early in the week. Costa now pairs with Hazard for the double and a great run in through the end of the season, with just a single away game remaining. He picked up just his third double of the season in GW34 but his form seems to be returning. Jesus seemed to be a no brainer, as Aguero limped off the pitch last week after a solid performance with a groin injury. Jesus returning to pitch after injury has looked great in just 2 appearances. Dynamic and excitable and very favorable fixtures to finish the season. This kid could post some great returns before the season is up. Games include Palace (H), Leicester (H), West Brom (H) and Watford (A). He will also wear the armband for my squad this weekend. The inclusion of Costa, Jesus and Stephens set me up for DGW37 leaving just 4 players who don’t have a DGW next week. When the transfer window opens for DGW37 I will look towards upgrading my defenders. Bailly and van Aanholt will be out and I’ll be looking at Man City and Chelsea defenders. It doesn’t appear I will have the budget to include one from each team. The decision will hinge on what I do with Jakupovic. The sole player remaining from GW1 will possibly be move for either Cech or Courtois. If I get Courtois, then it will be the budget defender, Holgate with no DGW to fill the final defender slot. For the first time in 10 weeks my decision making didn’t pay off and I was left to ponder move before the DGWs begin. While I don’t have any players in today’s match, Watford hosting Liverpool, I can only hope that the Hornets tighten things up and don’t give the Reds opportunities in and around the box. 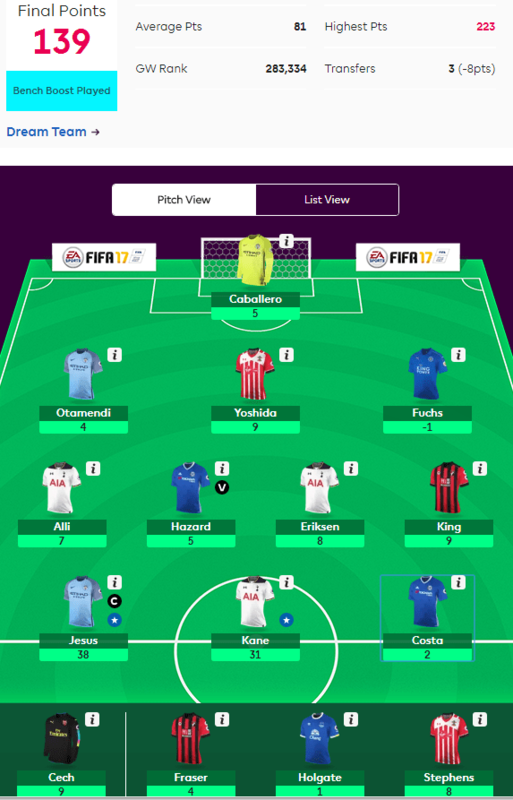 I finished GW35 with 57 points, which included 3 players with just a single point. Between the pipes I had been strong with Heaton and Jakupovic, but in a hasty, last minute decision I brought in Caballero. What a disaster! The once hot Crystal Palace has definitely cooled off. Their DGW34 wasn’t all that impressive, unless you owned Benteke. I chose Zaha and van Aanholt and held them over through GW35 for the Burnley match. Winless on the road, Burnley put in a great shift and held Palace goalless, 2-0. Zaha and van Aanholt (bench), each finished with a single marker. Benteke came into the squad replacing Llorente, played just 70 minutes and picked up a yellow card. Originally I had planned on holding Palace through GW37 and their home fixture against Hull, but their their defense ailing, these players may be in jeopardy. Another failed move this week, one that I was one leading up to GW35 was introducing Gabbiadini. He picked up 59 minutes in GW33 and 85 in GW34, with an assist against Chelsea. It appeared he could be back in form. Facing Hull in GW35 at home, the table was set, as he was highly transferred in and captained. At the same time I was considering Afobe as a budget buy in order to introduce Sanchez for DGW36. Following other managers Gabbiadini came into my starting XI. It was a very uninspiring performance for the So’ton forward, who now has us asking questions on the horizon of DGW36 and DGW37 for the Saints. At this point, you need to figure he could see a consider amount of playing time. I do believe he is their best option up top, but there is some risk with Long and Austin, who’s returning from shoulder injury. As of now, I have not see a return to fitness date, which could bode well for Gabbiadini owners. Liverpool, one clean sheet in the last 10 games and Arsenal, three out of the last 10 games, have given up goals, so Sot’on could profit offensively. Yet, it’s been the defense that has played better for the Saints. At this point, I do plan on playing Gabbiadini through both DGWs. Elsewhere up front, it was Kane setting the tone for Sunday, picking up another goal while wearing the armband for 10 points. This was his third return in 3 weeks as they play away to West Ham this weekend. In GW37 they face Man United (H) and Leicester (A). Kane is a starter for the duration, along with Eriksen and Alli, as I plan on all three Spurs players through the end of the season. Early chances weren’t converted or all three players would have posted higher scores. That being said, Alli picked up 8 points with a goal and CS, while Eriksen added another assist and CS for 6 points. On the weekend, it would be King for Bounemouth who topped all starters with 11 points, on a goal and 3 bonus points. While he doesn’t have a DGW, he will be play out the season in the starting XI. GW37 could see him as a strong captain option, home against Burnley, but the draw of the DGW players might be to strong, even with a solid match up. Hazard returned for his fourth week out of five with an assist and clean sheet. He’s been dynamic and vital to Chelsea’s run to the title, but has only played 90 minutes twice in the last 10 games. Home to Boro in GW36 should prove fruitful…then again I am sure owners of Man City players said the same thing. Speaking of Man City…Caballero, on paper looked to be the beneficiary of an injury to Bravo between the pipes. On paper, away to Boro appeared to be “business as usual” for City, who should have rolled into town and beat Boro. That didn’t happen, two goals and City were reeling, as they had to come from behind to register a 2-2 draw. As for Caballero, he was a late change on Saturday morning. I felt Heaton and Jakupovic didn’t have strong fixtures and I wanted to add a DGW keeper to my squad. In the end I opted to move Heaton, who scored 7 points against Palace, which included a CS and save points. But it was Jakupovic, 14 points that made me hurt. he registered a CS, save points, 3 bonus points and a penalty save. I can take solace in knowing I would have started Heaton, as he was in my starting XI before move to Slick Willy. Hopefully his gloves are more sticky come GW36. Defensively, I rant with just two defenders this week as I activated my All Out Attack chip. Staring defenders were Yoshida and Bailly, both put in solid shift rewarding me with two clean sheets for 12 points. Unfortunately, Bailly was lost on the stroke of 60 minutes, but I was able to get the full complement of points from him. He appears to be a risk for the coming game week, which means another hit to transfer in a healthy defender, unless I hold him out of the gameweek in an away match to Arsenal. Bailly had returned 42 points in the last 7 games! Tentatively I was rewarded a 9th green arrow in a row, a record I continue to build on, now in my 4th year as a fantasy manager. The 8 points hits, while beneficial, have still hurt my global ranking, as I moved up just 10k this week to 627k. It was my hope I would be around 300k by this week. I suspect I will drop after Monday’s game, but SHOULD remain with a green arrow. Looking towards DGW36 I am not sure what to do. More injuries have put me into a quandary over what direction I want to go for the next 2 weeks. With no WC to use and just the Bench Boost remaining, I know I will activate it in DGW37. Injuries to Bailly, Aguero and Afobe all come at a cost as further transfers will need to be evaluated to see if I can fit them within my budget, which now stands at 104.4, a season high for me. Initially plans called for Zaha and Benteke being transferred out in favor of Sanchez and Afobe. But the groin injury picked up by Aguero means that Jesus could be starting over the next few games. He looked excellent, partnering with Aguero up front in GW35. I am unable to bring both Jesus and Sanchez in, as I have a shortfall of 1.8m. So do we trust a very unimpressive Sanchez over back to back DGWs to flourish with the armband? Do we play the Brazilian young gun for City looking to impress with his flair and excitability on the pitch? Options include passing on Sanchez but adding Ozil, who’s got two double digit hauls in his last 5 games. This would allow me the budget needed to add Jesus to the mix. Adding Sanchez leaves me with only 6.9m for a third forward. That list includes Origi and Rashford at the top with the usual suspects; Negredo, Deeney and Llorente also available. Leading up to DGW34 I had been planning, scheming and strategizing on how to navigate GW34, GW36 and GW37. With DGW34 in the books, I have a solid core group of players to carry me through the end of the season. My previous article, Seeing Double had me favoring a Man City trio, not paying much attention to Arsenal or So’ton, each who play 4 games in GW36 and GW37. Injuries and a rethink seemingly have brought me full circle and now I have established, what I feel, is a good plan. Still, we need to get through GW35, but here’s how things are laid out. Notes: While neither player have a DGW remaining, both are in form and feel they deserve to be in the starting XI. Benteke has Burnley (H) this weekend and Hull (H) in GW37, that’s enough for me. Man City hasn’t been all that impressive on defense, and Palace could nip a goal or two in that match. Afobe may seem an odd pick, but a budget forward, has 5 returns in the last 7 games, which includes 3 goals. Remaining fixtures include Sunderland (A), Stoke (H), Burnley (H) and Leiceter (A). We know Eddie Howe loves his offense, Bournemouth are safe, goals could fly! His inclusion frees up budget for use in DGW36. Notes: Still high on Zaha, but I need to free up a midfield position in order to bring Sanchez in, who’s potential is too much to pass up. After GW35, it could be feast or famine for the Chilean, but DGW37 holds hope, Stoke (A) and Sunderland (H). It’s a case of I would rather be with, than without on the off chance he scores big. To free up the remaining funds, Holgate (4.1m) comes in with CS potential in GW36 and GW37. This is what my squad looks like for GW36, which would carry over to DGW37. Not sure what Big Sam’s intentions are with van Aanholt. I picked him up for DGW34, but saw limited play in just one game. Injuries have taken a toll on the Palace defense, but Schlupp still holds a starting spot. Depending on taking another hit in GW36, van Aanholt could make way for Jagielka, who was in my original plans, like Holgate has CS potential in GW36 and GW37, plus has some offensive prowess with 3 goals on the season. Fuchs, Yoshida and Bailly will constitute the rest of the defensive line due to DGW37. We are still a few weeks out from DGW37, anything is possible. Not too surprising to see how drastically plans have changed in the matter of 10 days, when I posted Seeing Double. The possibility of City players still exists, but with the uncertainty surrouding who to start, they have all taken a seat on the bench for now. We will wait and see what GW35 brings before formulating a new plan…if needed. This is the second in a two part recap of DGW34 (read Part 1 if you missed it), which ended Thursday, just hours ago as the Manchester derby ended in a scoreless draw. However, that’s excellent news for me, as I finished the week on 78 points. Not outstanding for a DGW by any means, but in this limited game week, where many managers fancied Negredo or Rashford as their DGW captain, I take solice in knowing Bailly picked up 24 points with the captain’s armband. Talk about a punt, but it paid dividends with the City and United going scoreless. Without the armband, Bailly was still my high weekly scorer with 12 points, just missing out on bonus points in the derby. My final score of 78 points has me seeing green for an eighth week in a road, a record for me in the 4 years I have participated. As mentioned, Bailly was major punt on my part. I felt confident he would start both matches in DGW34 and knew his offensive potential was limited, requiring CS in order to make this work. Burnley was somewhat of a given, even at home with their limited offense, United was able to handle the Clarets, 2-0. The derby had me questioning the move, as City dominated the game, but the resilient United defense came up with big saves, big blocks and a few timely calls from the officials. In a surprised turnabout…not really…Gibson came back to redeem himself as Boro shutout Sunderland, 1-0 where he picked up a bonus point. On the whole, my defense accounted for 38 points! I do believe Eriksen salvaged me from a rather dismal week with his goal in the Spurs 1-0 victory as he captured 11 points, with a CS and 3 bonus points. Alli was quiet in the win with just 3 points. There might come a time in the next few weeks I need to move one of these two players, currently it’s Eriksen that would be on the chopping block. After watching City today, I am not so sure I am ready to triple up on Sterling, Sane and Aguero. Hazard was supposed to be sold before this week to make way for City players. As it goes, he stayed in the starting XI and has me rethinking my strategy, which appears more foolish than foolproof. Hazard netted a goal, CS and 2 bonus points for 9, giving him good returns in 3 out of the last 4 games as we look toward an easy run to the end of the season after GW35; MID (H), WBA (A), WAT (H), SUN (H). Overall a very pleased 78 points as I move up in the global ranking to 637k, as improvement of 78k spots. Since GW27 I have gained 495 points, averaging 61.8/week, a figured just over the 60 points a game I had set as a goal. The DGWs in 36 and 37 will be the turning point of the season for me. If I can gain 120-140 points, I have a good shot at 2000 points, down from 2170 points last year and a finish in the top 75k. Both mini leagues have made a drastic turnabout, now sitting second in one, just 44 points off the lead. The other league sees me in fouth place, 6 points out of third and 133 from the apex. Hopefully positive differential players will give me an advantage starting in GW35. As I sit here contemplating GW35, I don’t really have a plan. My original of transferring up to DG37 has failed, as I didn’t bring in the necessary players last week, deciding to hold a few players back before of good fixtures. Two moves I know I will make, Gabbiadini and Benteke will grace my front line in GW35. With questions still surrounding the fitness of van Aanholt, he might need to make way for a DGW defender and I would like a keeper, most likely Forester to replace Heaton or Jakupovic. I was all hot and heavy into bringing in Aguero, but after today’s derby not sure that will be the case. IF a move is made for a City forward, it will be Jesus and most likely Sane if I double dip. With lofty exceptions, there was a letdown at the conclusion of the weekend games. I started GW34 with 4 players involved in DGW action; Bailly, van Aanholt, Zaha and Gibson. The only DGW fixture that appeared straight forward was Man United visiting Turf Moor and Burnley. Many managers, including myself took a chance on Middlesbrough. Gibson had been starting since GW30, but many transferred him in. I took a hit last week and bought Zaha to start in my 3-5-2. Van Aanholt and Bailly were late transfers, in order to take advantage of DGW34 and DGW37 for Man United. Crystal Palace also has good fixtures in GW35 and GW37. The weekend started off greast with King getting on the scoreboard for Bournemouth, but finished with just the one goal and no bonus points finishing with 8 points. Ten man Hull played outstanding after losing Niasse but Watford didn’t mount much of an offensive showing and goalkeeper, Jakupovic kept a CS for 6 points. Everton, as expected disappointed at West Ham, Lukaku had but one shot and really never was in the game, looked a bit lethargic offensive. Yet, that’s been his road form, poor…piss poor. This is the final weekend I will own Lukaku, who is being transferred out for GW35. Top performer over the weekend, Eric Bailly, solely based on the captain’s armband. Looking over my starters, including three Spurs players and a few different captain polls, there was never really a consensus captain. Names such as Negredo and Rashford, as well as Benteke and Kane seemed to come to the forefront. I decided on Bailly, as he had a DGW facing Burnley (A) and the Manchester Derby against City. Rolling the dice, I felt good about United shutting out Burnley, which they did, 12 points for Bailly to start the week. While City wasn’t involved in an EPL match this weekend, but visited Arsenal in an FA Cup semifinal match. City lost 2-1 in extra time, but registered 20 shots with just 3 on target. United have won 2 of the last 3 games, in all competitions against City. The last October 26, 2016, 1-0 in the EFL Cup 4th Round with 1-0 victories in their two wins. Confidence is high, this game could be played out to a 1-0 or 0-0, which would mean Bailly ends with a minimum of 24 points for the DGW. Of course that’s speculation, but that was my rational for captaining him. With lineups already set, it’s not too early to look to GW35 and impending changes to my squad. My “Seeing Double” plan went out the door in GW34, when I decided not to pick up Sane for City, as I was going to triple up with Sterling and Aguero rounding out my squad. A knock picked up by Aguero in their FA Cup match may have me changing strategy before GW35. More GW35 discussion later this week at the conclusion of DGW34. The current EPL season comes down to two weeks, as managers either planned or are scrambling to navigate the the DGWs in GW34 and GW37. Many managers have held their second WC and Triple Captain Chip until GW36 in order to maximize their opportunity for a big return. For me, I activated my WC in GW21 and my Triple Captain Card was applied to Aguero in GW27 for just 27 points. Managers were hoping to Sanchez would continue his run of form and triple captain him against Stoke City and Sunderland in GW37, but based on his last 3 fixtures (before GW33), it appears he might not be the best option. Since GW25 I have made 16 transfers with seven 8 point hits during this period. My season turned the corner in GW27, when I started a run of 7 green arrows that has seen my global ranking climb 947k to 682k! This run of success has me pushing for the top spot in both mini leagues, where I sit in 2nd and 5th place. With the help of Navigating the Double Game Weeks I formulated my strategy for the rest of the season. Using this article as a template I started looking forward to DGW34 and DGW37 in an attempt to maximize returns to end the season on a strong run. While it’s not the best DGW plan, moving forward without a WC means I miss out on potential points or risk take a -4 or -8 point hit in order to see a higher return each week. So far the additional transfers I have made have equated to a positive return of 15 points over those 7 weeks. Not great, but at least I wasn’t negative. Notes: Transferring Hazard will free up the addition budget I require to kick off this strategy. While they do have a favorable DGW in GW37, I feel there are stronger midfielder available with better fixtures. Grosicki, has been good for Hull, at home. While the Tigers need help, there has not been enough scoring to justify retaining his services. Mawson served his purpose, picked up a few goals, but Swansea is struggling…still. No DGWs and a mixed schedule, didn’t like those prospects. King and Sane come in on good form, more importantly with good fixtures ahead of them. King could be seen as a questionable selection with no DGWs but home matches against MID, STK and BUR. After GW34, City has a great looking schedule, thus the inclusion of Sane, who will face CRY, LEI, WBA at home and MID and WAT on the road with a DGW in GW37. Van Aanholt, back from injury could be a strong differential candidate. While the fixtures for DGW34 don’t justify it, his style of play could benefit Palace against Liverpool. His inclusion is based on GW35 and GW37 home to BUR and HUL. Notes: What could be seen as questionable transfers come to the forefront in this week. Llorente has been a waste of space, injured for 2 weeks and no returns in 4 weeks. Eriksen, really? Even now I have a hard time making this transfer happen, as he has been fantastic this season! Good returns since GW26 and a challenging DGW in DG37, I would rather hold Alli and Kane as the attacking pieces of my squad. Finally Lukaku, the Belgian has been outstanding…at home but atrocious on the road, just 12 points in his last 4 away fixtures. With 3 of the last 6 on the road and a home match against Chelsea, I can’t justify keeping him in the starting XI. Gabbiadini hit the EPL in grand form, 4 goals in 3 EPL games before succumbing to injury. He’s got DGWs in GW36 against LIV (A), ARS (H) and GW37 against MID (A) and MNU (H). Sterling will come in to partner with Sane for City with LEI and WBA at home in DGW37. Aguero is the final piece of this offensive puzzle, but not sure if that piece will fit, with the word that Jesus could be returning. That could call into question Aguero and his playing time or worse, rotation. It is Pep in charge, but with no UCL and Aguero in form, Jesus might be called upon from the bench. Thankfully I have a few weeks to wait and watch. Notes: The defense gets an overhaul, as Gibson makes way with no DGW in GW37 and a terrible schedule after GW34 there were better options. Heaton has been masterful between the sticks and with good fixtures to finish the season, like Gibson Burnley doesn’t have a DGW. Vertonghen comes in for the final 3 weeks of the season, away to WHU and WBA and a DGW in GW37 against MNU (H) and LEI (A). He’s the cornerstone of the Spurs defense, his inclusion could be questionable depending on the return of Rose. Courtois, currently injured, returns to my squad as Chelsea look to win the EPL Championship. Three out of the last four games are at home with WBA and WAT in DGW37. Notes: The final piece is put into place, as Fuchs makes way for Monreal, who faces STK (A) and SUN (H) in DGW37. Arguably the best DGW fixtures in GW37. Not much for Arsenal defenders this year, at least Monreal gets forward in that wing back position. The team above costs me 103.5m, leaving me with 0.7m ITB for unexpected changed. As I mentioned earlier, this plan looks great on paper, but how it actually plays out is another story. Potential injuries, falling out of form or the return of players from injury could change my strategy. I don’t move forward without concerns, most notably the “second coming” of Jesus at City. Not including Hazard (30.6%), Sanchez (24.8%) and Lukaku (46.9%) is risky, all are highly owned and all have been in form, Sanchez for much of the season, excluding the last 4 weeks. For DGW37, this gives me 8 players with two games, which potentially could be 9 players if I select Gabbiadini over King or Zaha. While I don’t have it on paper yet, I am working on a contingency plan, which could include Townsend or a Chelsea defender. Up front if Aguero becomes a rotation risk I will make the move back to Ibrahimovic, but United’s DGW37 is tough; TOT (A) and SOU (A). It’s a risky proposition, but many fantasy managers wait for the DGWs in order to make their moves, activating this WC and chips. Final note, speaking of chips, I only have my bench boost and all out attack remaining, as I played by triple captain chip back in GW27 on Aguero. GW35 I will plan on using my AOA chip nd GW37 will feature the bench boost.